Saucony Ride 9 GTX Reviewed - To Buy or Not in Apr 2019? Saucony started over 100 years ago and is an American company specializing in athletic gear, especially for runners. They have developed and perfected their running technologies over time with everything from track racing spikes to long-distance trail running shoes. The GTX is the waterproof edition of the newest installment of the ever-popular Saucony Ride 9. This is a great choice of shoe for winter seasons or other wet seasons with all of the features of the non-Gore-Tex version. Everun technology gives a nice ride and good energy return. Comfortable and supportive, it is a good half to full marathon shoe, great for distances. The generously padded heel cup is very supportive and keeps the shoe fitting snugly. FlexFilm overlay and lacing system gives a nice and secure fit. According to some runners, there is a lengthy wear in period. The fit in the forefoot is a bit narrow. Runs small so you may need to go a half size up. The outsole uses a blend of two different types of rubber, the more durable carbon rubber (XT-900) for those high impact areas and blown rubber (iBR+) for areas essential in providing traction. iBR+ is blown rubber and helps improve lift off in the forefoot area. It is 33% lighter and more cushioned than other types of blown rubber. The Tri-flex layout outsole is great for traction and provides flexibility despite the thick midsole cushioning. 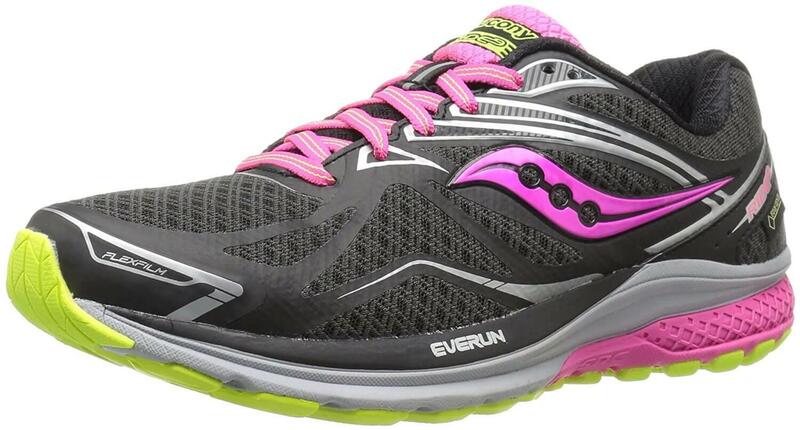 This outsole design is found in many of Saucony’s other popular shoes such as the Kinvara or Triumph series and has proven to provide more traction during toe-off, which is especially useful in wet conditions. The GTX version maintains its 19mm stack height and has tons of cushion for any stride. The Everun material offers great impact protection as well as a nice responsive feeling for toe-off, it also boasts more energy return than other EVA materials. This shoe also features the SRC (super rebound compound, which provides additional cushioning in the heel and further improves the responsiveness of the ride. This midsole provides excellent cushioning from touch down to lift off while also encouraging runners to lean forward for an efficient stride. Many runners complimented the Everun in their forefoot cushioning. The GTX's upper is very lightweight and has increased durability thanks to the Gore-Tex mesh. Despite being a waterproof shoe, the upper remains highly durable. FlexiFilm technology uses an overlay system that gives this shoe a snug feeling while clinging to the foot and increasing overall flexibility. The FlexiFilm is lighter in weight than the Ride 8’s stitched upper, despite it featuring Gore-Tex. It is overall relatively lightweight. The Gore-Tex also adds some durability to the upper and runners are not seeing the tearing that happened in the Ride 9 line. Saucony’s goal was to make a lightweight, responsive, cushioned shoe that was great for longer runs and luckily, they have accomplished just that. The Gore-Tex version weighs slightly heavier than the non-Gore-Tex version, but overall, it is a lightweight shoe, especially for the amount of cushion and support you get. The Gore-Tex version weighs 9.6 oz for men’s (vs 9.3 for the non-Goretex) and 8.6oz for women (vs. 8.3oz). Overall, not a huge difference in weight. The FlexiFilm upper is great for breathability and the Gore-Tex version of this shoe maintains this breathability very well. A lot of air passes through the shoe, making it ideal for runners who need an all weather shoe with waterproof qualities without sacrificing traditional cooling features. This is a great shoe for wet and humid weather. If you love breathability but hate getting your feet wet, certainly check this one out. 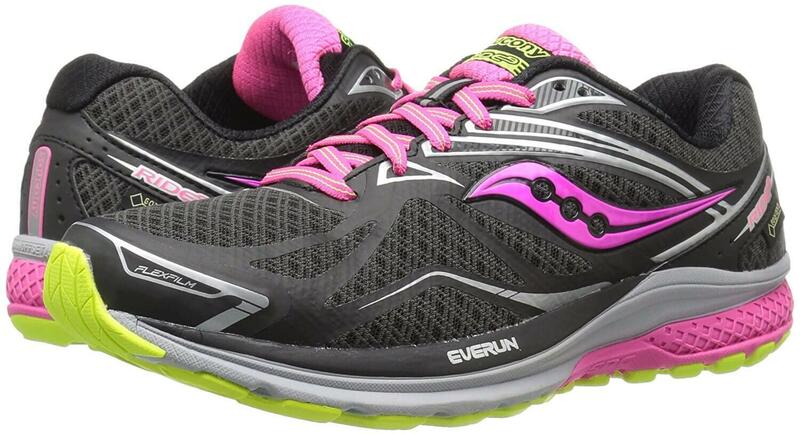 This is one of the more cushioned shoes Saucony makes with a moderate to soft cushion throughout. Many runners are impressed by the comfort features of this shoe. It is meant to get you on your toes for a powerful push off while still supporting your stride throughout.The GTX is a good shoe for runners who suffer from overuse injuries and the Gore-Tex makes it even more comfortable by keeping moisture out and preventing blisters. There is also a lot of impact protection for every type of stride and some reviewers describe the Ride experience similar to walking on clouds. A lot of users also reported using this shoe for everyday use. Overall, it is a great shoe for anyone who has to spend a lot of time standing or walking. There is a moderate break-in period especially for runners needing a little bit of a wider toe box. The GTX comes in one color variation for men and one color variation for women. This is primarily because the Gore-Tex material is usually black or dark grey. Both color variations are quite conservative making this a great shoe for everyday use as well as running. The overlay material, laces, and inner lining offer some fun accents, orange for men and pink for women. The Gore-Tex upper enhanced the durability of this shoe, making it a good quality shoe which you can take on many long training runs. The outsole is made using two different kinds of rubber: a harder rubber for those areas that are more susceptible to wear and a blown rubber which is great for traction on a variety of road surfaces. The FlexiFilm encompasses the mesh and synthetic outer layers and provides a very solid feeling upper that can stand everyday use. Overall, it is a well-designed shoe, built with durability in mind and great for long distances. The Everun material has also stood up fantastically to everyday use and continues to provide great impact protection and padding for all types of runs. This shoe’s support features give some great protection underfoot. With its 19mm stack height, you are far enough above the ground so that you feel protected from any rocks or debris, and the toe cap will help block anything that gets higher up. The FlexiFilm ensures that the shoe stays close to your foot to further improve stability on the road. The upper in this GTX version is durable so that you do not have to worry about any sticks or rocks breaking through. The Gore-Tex upper also keeps moisture out so that you do not have to worry about blisters caused by friction and the toe cap makes it so you do not have to worry about stubbed toes or bruises. The GTX is a good shoe for people who want a responsive ride without giving up their cushion. The Everun technology is livelier and more responsive than other EVA materials and also boasts a higher energy return. This means that you get nice, responsive feedback without too much ground feeling, which allows the wearer to maintain a good pace. This is a nice shoe for longer distances, whether you are training or running a full or half marathon. There are lots of good support features to support you throughout your stride and also keep you on your toes for a good lift off. The shoe helps discourage you from overpronating while also catering to a neutral runner's stride by providing a light amount of arch support. It was designed to fit the form of the wearer's foot and keep the foot connected to the midsole and outsole unit. There is also a lot of cushioning to protect you from overuse injuries or flaws in your running stride. The Triflex outsole is great for a variety of road like terrains. This is the same outsole design that can be found on many of Saucony’s shoe designs. It provides flexibility and combines the two types of outsole rubbers to make the shoe durable with plenty of traction on roads, pavement, cement, track and light trail. The shoe retails at $140 USD, which is $20 USD more than the non-Gore-Tex version. Although the price might seem a little steep for some, it offers some great features for the price. The comfort to weight ratio is especially key. It is a highly cushioned, durable, lightweight shoe and the Gore-Tex makes it ideal for all weather conditions. If you can find this shoe on sale, you are really getting a good deal. The iBR+ was built for traction on toe off. That combined with the carbon rubber on areas more prone to wearing out make this a great road shoe. A strong toe-off has been shown to improve speed and responsiveness. The Triflex tread and groove pattern is also great for increased flexibility on any surface. Cushioning is the goal of this shoe and with 19mm stack height, runners can’t expect a lot of flexibility. However, the FlexiFilm upper does work to build a little flexibility within the shoe and make it stick to your feet throughout your stride. The Triflex bends in strategic places to get increased flexibility and help you stick to the pavement and toe-off more easily. The lack of flexibility makes this the ideal shoe for getting a nice consistent ride for long distances. While being a neutral shoe, this model offers some great stability features. The outsole and midsole material encourage runners to get up on their toes and get a strong toe-off. The cushion also makes this a great shoe for people who have impact related or overuse injuries. The consistent cushioning is great for long distances and will really help in the late stages of a marathon distance race. This is a neutral shoe with some stability built in. It offers the freedom and flexibility expected in a trainer while still having the features that will encourage proper form throughout your stride. The 8mm drop allows for a little extra cushioning under the heel, and should you land heel first, it helps dissipate impact, which is especially nice for runners prone to getting plantar fasciitis. •	The lightweight Flexifilm material helps lock down the foot while also providing the shoe with a flexible and seamless feeling. •	iBR+ is one-third lighter has more cushioning compared to other kinds of blown rubber. •	SRC is underneath the shoe's sole and helps to soften landings and absorb shock. •	Everun technology gives the cushion a livelier, responsive feeling for smoother landings and stronger take-offs. •	The inner lining uses Rundry technology to wicks away moisture to give the wearer a dry and comfortable run. •	Triflex technology in the outsole provides better toe-offs and more contact with the ground than other technologies. •	Outsole uses XT-900 carbon for improved grip and durability. •	Gore-tex in the upper adds durability and keeps moisture away. The GTX has all the great features found in the Ride 9 but with Gore-Tex. The addition of Gore-Tex has made the shoe slightly more durable, while still maintaining its light weight. Still designed with durability and comfort in mind, this is shoe built for colder, wetter climates. The Gore-Tex in the upper is also still highly breathable but pair it with a warmer sock, and you are ready to tackle the colder temperatures. This is an ideal trainer that will easily find its place in any training rotation or even for running a half or full marathon. The neutral colors make it a great everyday shoe as well, ideal for anyone who spends a lot of time on their feet. If you want a sleek looking shoe that is able to go on long distance runs, check this shoe out.